Those days, when I first started working I had more than 20 lipsticks. I always ended up throwing them away after 3 yrs due to expiry. Now, I try to limit myself not to make any lipstick purchase till half of the current stocks are used up. 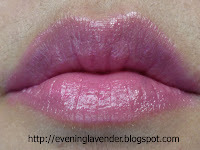 I am currently using Estee Lauder Pure Color Crystal Lipstick in 303 Crystal Pink. At the moment, this is one of my favourite lipsticks. I like its sheer coverage. It is not sticky. The color glides easily and the scent is also quite nice. I usually apply lip balm or gloss before applying lipstick. However, when I am using this Estee Lauder lipstick, I do not have to use any lip gloss as a base. It can be used as your lipgloss if you apply 1-2 coats. In the above picture, I applied 3-4 coats and yet it looks sheer. That's why i like this Estee Lauder lipstick. It does not make your lips looks so "cakey". What brand of lipstick is your favourite? Thanks for sharing. You got the estee lauder blockbuster too is it? You have such cute lips! 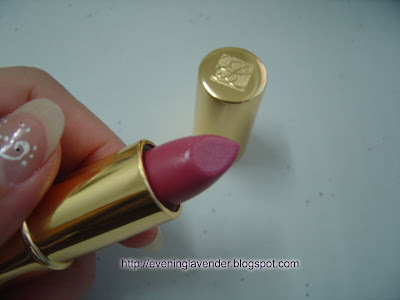 :D I must admit that I've never used Estee Lauder lipsticks before. This one sounds very moisturising. The shade that you have is such a cute pink! Hi friends, Thanks for your comments. Thanks for praising my lips. Thanks for following and glad that the mask is suitable for you. hehe.. reminds me that I need to take out some for CNY use!